MORGANTOWN, W. Va. (September 5, 2018) - With just over a month before the motocross racing world descends on legendary RedBud MX for the 2018 FIM Motocross of Nations, MX Sports Pro Racing has announced that Heath Wolfe, of Harpers Ferry, West Virginia, is the winning recipient of the "Win MXON" raffle. Wolfe and his son will receive an all-expenses-paid trip to RedBud for the world's biggest professional motocross race on October 6-7, where the Official Team USA VIP Experience will provide them with team credentials, official Team USA uniform and attire, and access to the Alpinestars Official Team Hospitality Center. The Wolfes will help cheer on the U.S. lineup of Eli Tomac, Justin Barcia, and Aaron Plessinger as they look to protect home soil and give America its first Motocross of Nations victory in six years. The season-long "Win MXON" initiative raised funds for the Alpinestars Mobile Medical Unit, which provides an emergency care facility to racers and crew at each round of the Lucas Oil Pro Motocross Championship, at no cost to its recipients. 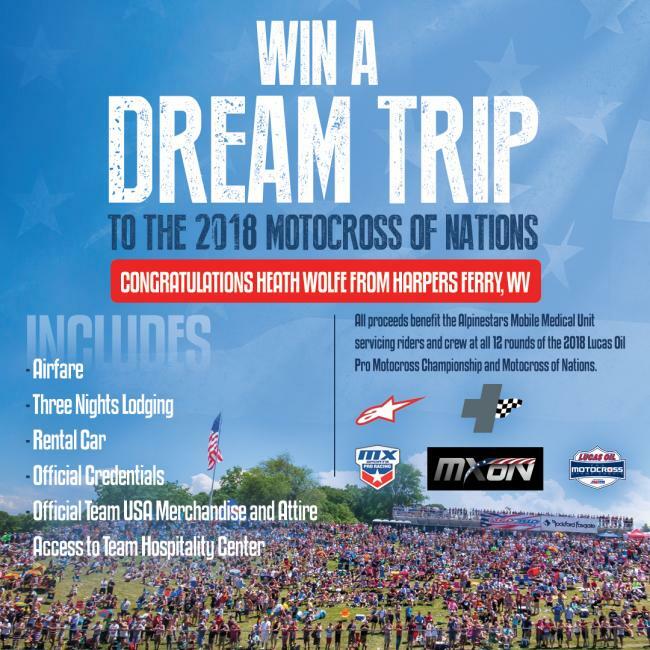 Throughout the summer, a donation of just $10 allowed fans across the country to enter for a chance to earn the motocross trip of a lifetime as an honorary member of the United States squad at the annual Motocross of Nations. "The contributions of the Alpinestars Mobile Medical Unit to the Lucas Oil Pro Motocross Championship simply cannot be overstated. Their service is unprecedented and critically important to the health of our athletes, and we are committed to fundraising efforts to provide added assistance to the cause," said Davey Coombs, President of MX Sports Pro Racing. "We are eternally grateful for everything Tom Carson and the entire Medical Unit team do for the sport's athletes and race teams, and through the Win MXON raffle we're also able raise awareness for their efforts." The new aluminum 53-foot Alpinestars Mobile Medical Unit hospital trailer is staffed with qualified and experienced medical personnel, features specialized equipment for the sport's unique injuries, and houses a trio of on-track safety vehicles that can respond immediately to any incident. The Alpinestars Mobile Medical Unit is provided to the racing community with the support of Alpinestars, with additional funding provided by MX Sports Pro Racing, Feld Entertainment, Road 2 Recovery Foundation, The Kurt Caselli Foundation, the AMA, Blue Media, private donors, and initiatives such as "Win MXON". ©2018 MX Sports Pro Racing. All rights reserved.